← CHARLES LIVINGSTONE. Crown Casino -Too big to regulate? FRANK BRENNAN. Public servant to the First Australians. In Australia, there have been many children of the manse who have gone on to be great contributors to Australian society, regardless of their own religious faith or practice. Barrie Dexter was one of them. Barrie’s father Walter was one of the great Anglican chaplains in World War I before then ministering at Geelong Grammar and in Victorian rural parishes. Barrie recalls often attending the Anzac dawn service with his father in Geelong and in Melbourne. Jocelyn and Brigid have similar memories as children being accompanied by their father Barrie here in Canberra. Jocelyn and Brigid are right to think that Barrie would have been very home here at the Australian Centre for Christianity and Culture as a venue for his last earthly farewell — here in the chapel beside the splendid mural (pictured above) of the Holy Spirit in Our Land by the late renowned Elder, Lawman and painter of the Gija People (East Kimberly), Hector Jandany. 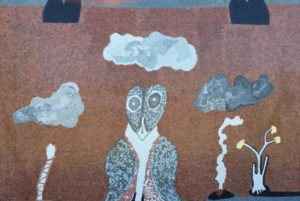 The mural wonderfully bridges Indigenous and Christian spirituality through an interpretation of life of the Spirit in the land and the lives of its people. The original painting was commissioned by Sir William Deane when he was governor general. We recall that Sir William delivered the eulogy at the funeral of Barrie’s colleague on the Council for Aboriginal Affairs, Dr Nugget Coombs. Deane highlighted Coombs’ capacity to argue passionately for the welfare of Aboriginal Australians and their right to be different: ‘different in their human, material and spiritual relationships — to each other and to the land and its resources’. Barrie had the same vision, capacity and passion. Coombs had delivered the eulogy at their colleague Professor Bill Stanner’s funeral when he spoke of Stanner’s ‘comprehension of the spiritual and poetic qualities which lent [Aboriginal society] coherence and gave meaning to the universe of which it was a part’. Dexter shared that comprehension with Stanner and Coombs. Barrie had issues with church dogma and ‘what you might call the political performance of the church over the last two thousand years that it leaves a rather sour taste’. But like the suffering servant in Isaiah, he did not shout or cry out, or raise his voice in the streets. A bruised reed he did not break, and a smouldering wick he did not snuff out. In faithfulness he brought forth justice; he did not falter nor was he too discouraged — though Billy Wentworth and Gordon Bryant provided their challenges, to say nothing of the Department of Interior. He persevered until he saw land rights legislated in the Northern Territory — the establishment of some justice on this part of the earth. With Brigid and Jocelyn, we thank God for the life of Barrie — their father and father of Tim, husband of Judith, and public servant to the nation, especially to the First Australians. We pray in thanks that the Lord is Barrie’s shepherd; he shall not want. The Lord now maketh Barrie to lie down in green pastures, leading him beside the still waters. How fitting that the formal eulogy will now be delivered by Patricia Turner one-time CEO of the Aboriginal and Torres Strait Islander Commission, and deputy secretary of the department of Prime Minister and Cabinet. 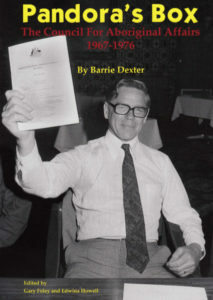 Nothing gave Barrie greater pleasure than to see Aboriginal Australians replacing him and taking their rightful place in the administration of the nation, determining the best use of Pandora’s box. This article was first published in Eureka Street on the 15th of April, 2018. This entry was posted in Indigenous affairs, Religion and Faith. Bookmark the permalink.